The Town of Brome Lake are doing double duty as fashion police, enforcing new regulations that prohibit residents from wearing regular clothing and forcing all residents to wear colorful duck costumes at all times. The Town is going what some feel is one step too far by stipulating that all residents must wear duck costumes whenever they are in public. The town leaders are taking the measure to boost tourism in the area and to put everyone who lives here in “a better mood”. The new rules are on a sign posted on Knowlton Road. Not only are pants, skirts and overalls completely forbidden and see-through tops, mini skirts and short shorts are out, and underwear is required to remain invisible under the duck costumes. Hats also are banned unless they are completely made of feathers. "A lot of people have gotten away with inappropriate clothing in the past. Hopefully this will prevent it," said one of Knowlton’s business operators who is in favour of the new laws. The new by-law also stipulates that all dogs and cats who are pets must wear duck costumes as well. 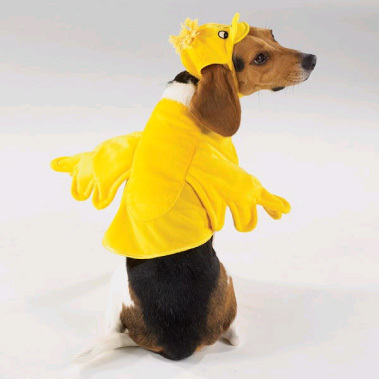 Town officials said, "we can't have dogs and cats appearing as dogs and cats when everyone else is a duck...it doesn't make sense so all pets will be required to wear mini-duck costumes! My dog loves it...he's been wearing it around the house for a week already!" Plans to include cattle and horses in the bylaw were dropped as the cost of making such large duck costumes was determined to be astronomical. Warm weather brings out more bare skin, and sometimes visitors bare even more, officials say. By forcing everyone who lives in Brome Lake to wear duck costumes the town is hoping that tourists will be more inclined to Knowlton as it will be a village filled with ducks! "The kids will love it and it will be good for business!" someone said. "I don't know how to put it delicately, but some folks who live in Knowlton just don’t have any fashion sense and seeing poorly dressed residents can cause tension for visitors. That's not a good thing in this kind of environment," he said.